I’m one for the gaudy souvenir. No matter where I go, there’s always something just a little bit over the top that is worthy of taking home. As I stood before the pet shop window in a Cancun shopping mall, I was seriously considering a purchase that would not only commemorate my visit to this Mexican resort destination but forever remind me of my ignoble but nonetheless landmark introduction to the hallowed sport of golf. Despite having been in the tourist industry for decades, where golf is not just a pastime but an important business lubricant, I’d never considered taking it up. I already had more than enough obsessions. I’d travelled with a lot of musicians and many have given up such harmless activities as trashing hotel rooms and throwing televisions into swimming pools to chase a little white ball around rolling greens. It’s all some of them can talk about. Even Alice Cooper spent much of his first stint in retirement playing golf with Bob Hope. It doesn’t get any more bizarre than that. I was staying at the Moon Palace Golf & Spa Resort, an enormous complex of almost 2,500 guestrooms, 15 restaurants and 12 bars perched on the edge of the Caribbean. The resort itself was somewhat of a revelation in that it is all-inclusive. The room rate included breakfast, lunch and dinner, every snack in between and all drinks. Australians know the all-inclusive concept from the generally cheesy Club Med model but nothing prepared me for this. Every restaurant, from the buffet to the fine dining Italian, Brazilian, Mexican and steak house, and every drink, from the wonderful local dark Dos Equis to top shelf tequilas and Grey Goose vodka to Argentinian, Italian, French and Italian wines by the glass and bottle, were all free. Our host, Brett, was a mad golfer and, as the other members of the group were focused on trying out the spa, I was his only possible golf partner. I’d warned him well in advance that I’d never even set foot on a course before but he overlooked such a trifling detail, something I’m sure he regrets to this day. A Jack Nicklaus design, I’m reliably informed that it’s a 7,165-yard 72-par course with a signature 17th hole that’s a 151-yard par 3 that plays downhill to an island green. It meant very little to me then and even less now. We fronted up to the Pro Shop on a wonderfully warm and humid afternoon and were outfitted with shoes with little spikes, golf clubs and an electric cart that included a chilled cooler full of mineral water. The first sign of trouble came on the practice range. Mimicking Brett’s stance, I fired off a few balls but no matter how I positioned myself they always went off at right angles. I could connect easily enough, I had the strength and the range but pointing them in the right direction, even a passingly similar compass point, proved impossible. Sensing that this could be a far longer game than anticipated, Brett swapped the bucket of 20 used balls for an even bigger bucket of 50. And this for just nine holes. I considered even that overly optimistic on his part. The greens were draped with iguanas of all shapes and sizes, lazily basking in the sun and seemingly oblivious to the danger that faced them. Some were huge, extras from Jurassic Park, and all had an upright, elegant carriage that intimated a fierce temperament. Luckily, none of my golf balls went anywhere near them, spearing past at sub-sonic speed into lakes, forests, thickets, adjoining greens, clubhouses, public roads, Mayan cultural landmarks, sinkholes, anywhere but where they supposed to go. I heard of no fatalities that day although there were times when an ambulance would speed by, lights flashing and siren wailing, on its way to an emergency call that I immediately felt responsible for. We ran out of balls before the ninth hole and decided it was wise to give up. 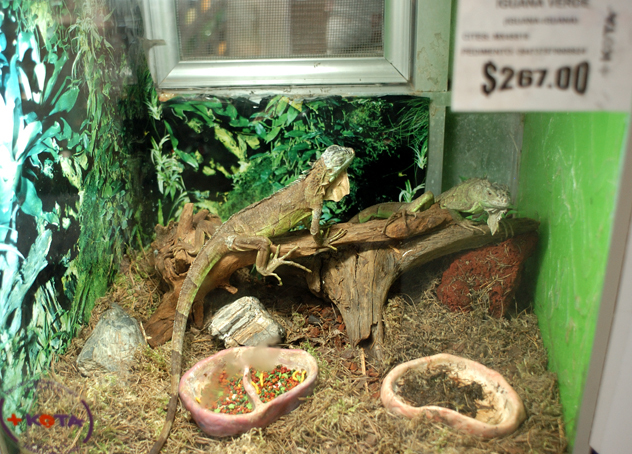 Later, in front of the pet shop, I felt the urge to rescue the iguanas in the window. I knew I couldn’t take them back to Australia. But I could set them free far from a golf course where they may come to harm from a golfer like me. If the World Wildlife Fund was truly serious about saving endangered species, they should pay me never to play golf again. The iguanas of Cancun would, I’m sure, agree.